One day I googled myself and I was caught off guard by a blog link that had me tagged as one of his Top 10 Most Inspiring Athletes of 2019! I had met the guy while hiking and considered him a dear friend. At first I smiled; feeling like I had somehow been a positive in his eyes, then almost immediately it read that he met me while hiking in Nepal to base camp of Mt. Everest and that my BMI was that of a mack truck! Instantly real tears fell. Not tears of his writing, but tears of truth about my struggle to achieve fitness. Who was I kidding? Mostly myself it seems. I grew up a competitive gymnast. I was always on a scale and measured my success based on a number that ranged between 114 and 119. Fast forward from age 14 to age 44 and I had been married, divorced, raised two children as a single mom, and was completely disconnected from the fitness I knew as a young adult. My mind, however, continued to crave challenges, even in a 230-pound body. 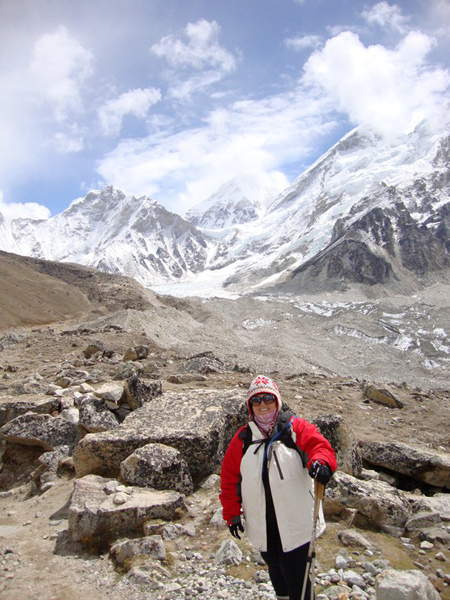 For all the struggle that it took to walk up into the Himalayan mountains 80 pounds overweight,it never began to stop me. He wrote that it was my perseverance that got me on his Top 10 Athlete list. I always describe myself from the shoulders up as a ‘Michael Phelps type‘ and from my shoulders down more of a ‘John Belushi type’. I am part extreme athlete, part party girl. Too much brie and wine and not enough cardio. 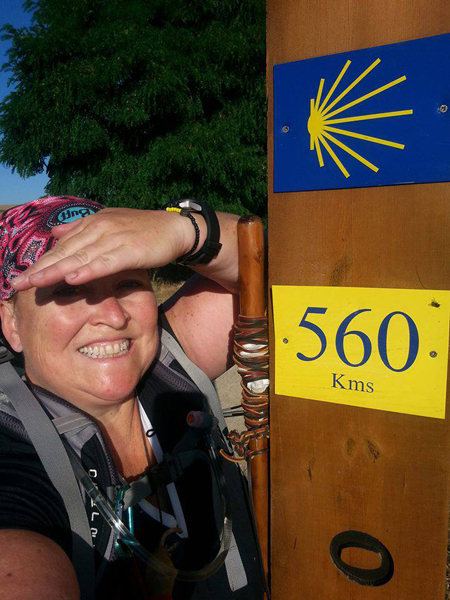 After more than a decade of athletic events where I have fought with the struggle of weight in competition I decided that my next adventure would be a 450-mile walk across Northern Spain; the Camino de Santiago. It is a spiritual pilgrimage that took me through the heart of many regions in Spain. Once again I would carry the extra weight on my body and an additional 30-pound backpack with all the necessary gear I would need in my 40 days of hiking. I wanted to remove myself from all of the excuses at home that get between me and a stronger, more fit body. I left behind the wine, cheese, friends, family, dishes, laundry, job, dog, television and my comfy new couch. They’d all become specks of home reality in my rear view mirror as I landed on Spanish soil. I would be forced in to my own mind and body for hundreds of miles and countless days. I wanted answers and to be accountable to myself. I would have no other choice but to face the dragons in my head, that for decades have defined my mindset and impacted my choices. Face them I did. I had arrived in Pamplona (near France) and struggled with my limited Espanol to find my way through the city to the albergue (hostel) I would be sleeping in. I was equally excited and scared. Anytime I take on a big challenge, right before it begins, I feel what I think is similar to stage fright; what if I fail miserably? The possibility of failure never dawns on me until I am standing at the starting line and then I am like ‘holy crap, what am I doing here?!’. In the first few of 37 days I started out weak and overwhelmed. I created mantras to help me continue a forward movement when it was uphill; Kay, you have a strong mind, strong heart, strong lungs and strong legs. I must have repeated it hundreds of times when the pain of my body was trying to convince my mind it needed to stop. With the weight of my body and the weight of my mochilla (backpack) I had no extra room for the weight of negative thinking. Day after day, mile after mile, I eventually forced out the negative talk. It served no purpose in achieving my goal. As my body got stronger my waist got smaller and I grew to feel more than toleration for my body. I actually began to feel good about my hips, thighs and arms, still not slim or perfect, but incredibly strong and resilient. I now connect with a true appreciation for this gift; my body and its effort to get me through 450 miles on the Camino de Santiago. 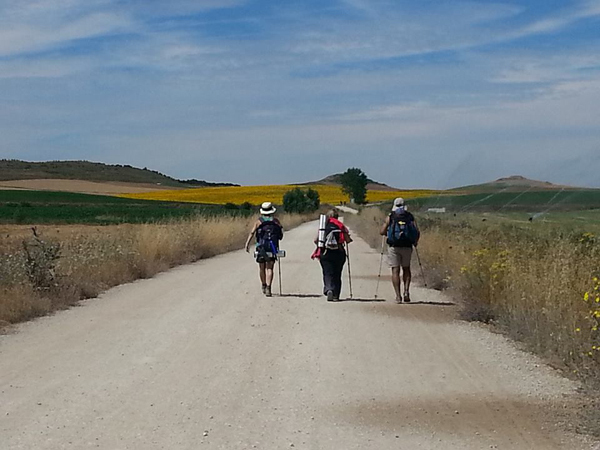 The word camino means ‘the way’. I am on my healthy camino. I am no longer measuring my success by a number; be it on a scale or in a pair of jeans. I am measuring my success in my effort each day, knowing that some days are off and I can get back on my camino with just one choice. The truth of my journey through athletics and struggle, life battles and dreams, is that I am on my own Top 10 Athlete list. Google me if you want.